Once upon a time there was this young woman who saw a beautiful velvety palette full of neutral eyeshadows. 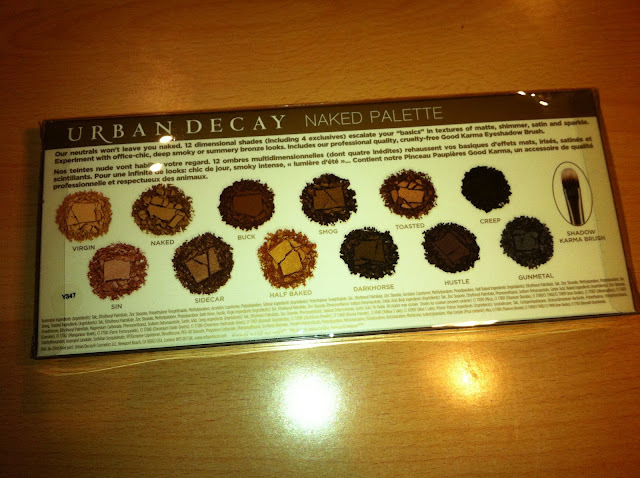 The woman wanted this palette so much but couldn't get it in her land. So she searched and searched for it all around the world. She saw it on Ebay but it was 69.99$ or more plus shipping, plus possible custom expenses so she thought to herself: "No, I must wait, now, BUT some day we will meet." And that day came. 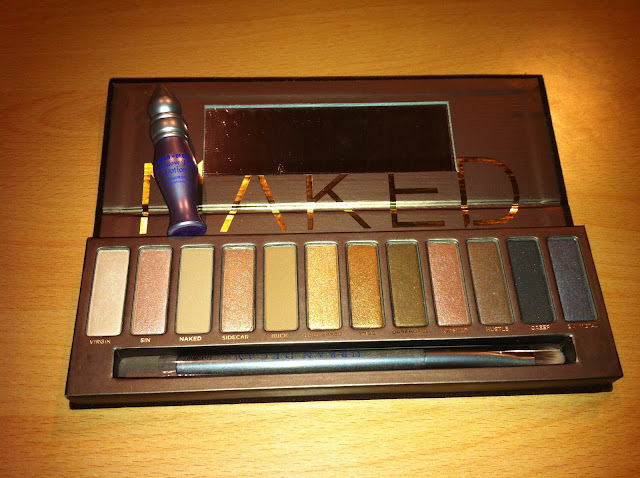 I found it on hqhair for a good price (I LOVE COUPON CODES) and bought not only original NAKED palette, but also NAKED 2. Now I have them for a couple of weeks so I am ready to say a few words about them. At first I thought that I'll write a comparison but it was too long, so I decided to do a NAKED series. This part will, obviously, be about original NAKED palette, than NAKED 2 post will follow, and at the end I will compare them. 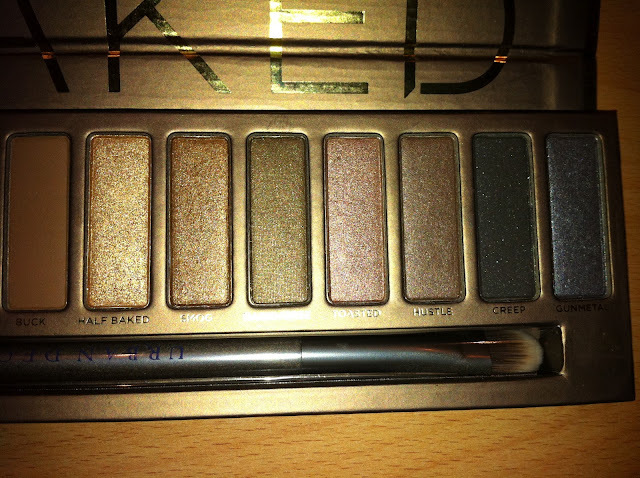 The palette has a velvety exterior which I personally love. Inside you get 12 eyeshadows (2 matte shades and 10 shimmery ones). 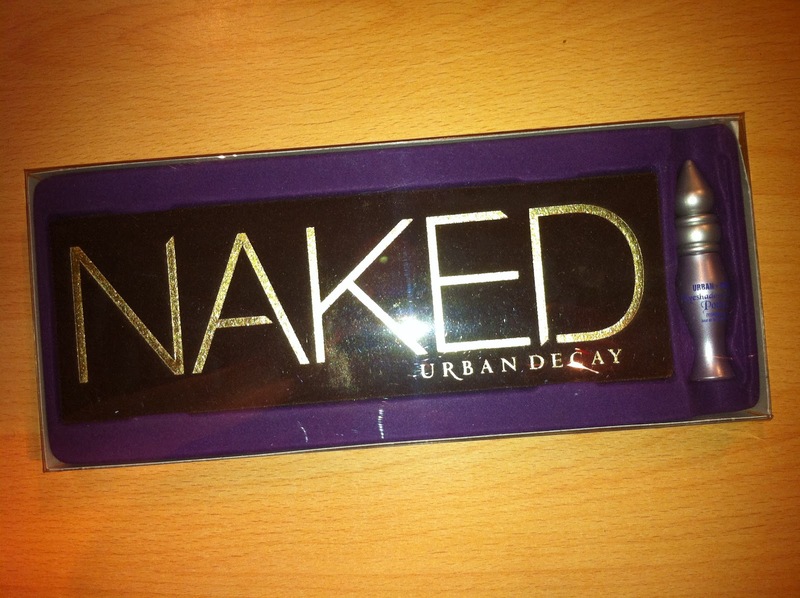 There is also a cruelty-free Karma eyeshadow brush, an UD Primer Potion (3.7 ml/0.13oz) and a good size mirror. Virgin is a creamy shade which also has a creamy texture. It is a great highlight shade and it can also be used as a lid colour for more subtle look. Sin also has a creamy texture. It is a great lid colour and the shade is somewhere in between light skin tone colour and apricot. It has a shimmery finish. Naked is a very versatile light brown/grey matte shade. It is great for hooded eyes because it can lift them up if applied just a little bit higher than the actual crease. It is also perfect for blonds and lighter brunettes if used for eyebrows (it is not a dupe for velvet revolver by Too Faced but it is the same kind of eyeshadow). Sidecar is a shimmery brown shade that looks kind of bronzy when applied. Buck is a darker brown matte shade. It can also be used for eyebrows (for darker hair) and it is a great crease colour because it gives more depth to the eyes. Halfbaked is a bronze shimmery shade. Smog is a darker brown shimmery shade with a golden gleam. Darkhorse is even darker brown shimmery shade but without that golden gleam. Great for outer V.
Toasted is a bronze brown shimmery shade. Hustle is a dark brown shimmery shade. Creep looks beautiful in the pan and it is a great shade but I find that it is the least pigmented. You can achieve that darkness but you will have to work a little bit more to do so. It is dark grey with very fine silver glitter. Gunmetal is a perfect silver/brown shimmery shade. Highly pigmented. When all things considered, this is a nice neutral palette. You can do lots of different looks with it. All the shadows have good pigmentation, they are creamy and easy applied. They wear really well during the day. 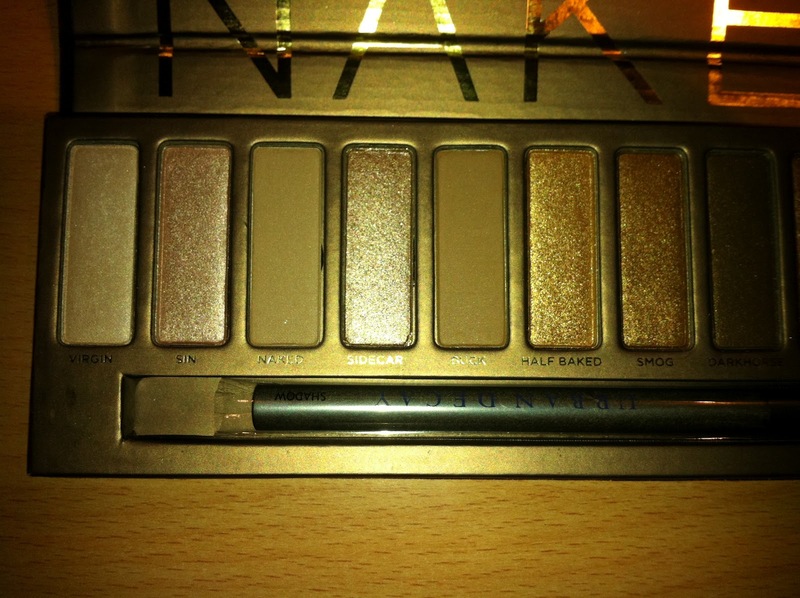 It is a warm palette because most of the shades have golden or bronze gleam. Even creep and gunmetal look warm when applied, although they are silvery grey shades. The only thing I am not impressed with is the Karma eyeshadow brush. It is not the greatest for applying eyeshadows but it can be used for concealer. I would prefer double ended 24/7 glide on eyeliner pencil but unfortunately they are no longer a part of this palette. All things considered, most women would like this palette if they are looking for something school/work appropriate. The price is acceptable in my opinion. Here is the thing. I love watching gurus and reading blogposts from USA but everything is much more affordable there. 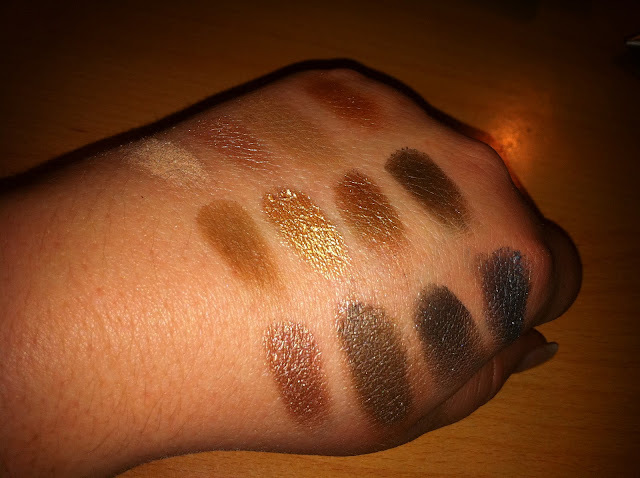 So, to get 12 eyeshadows of this quality from a good brand, is a good deal by European standars. I got mine from http://www.hqhair.com/ for about 33 Euros (shipping was free). It is more expensive but hqhair has frequently coupon codes so I advise you to search for them. That is all for now. If you have any questions, please, don't hesitate to ask me. I wish you a great week and bye!! !